Casebook of Organizational Behavior provides a panorama of absorbing, appropriately complex, modern cases from a diversity of work and organizations. 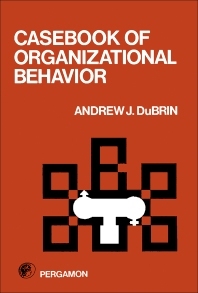 The cases chosen are designed to illustrate a wide range of organizational behavior concepts and principles, those ordinarily described and discussed in any comprehensive textbook in organizational behavior. This book is organized into five parts encompassing 44 chapters. It rests upon a foundation of cases about human behavior in organizations drawn from a wide variety of settings. Cases in each chapter are chosen to illustrate concepts that fall under the particular chapter heading, but the classification is not rigid. Each case is accompanied by several questions designed to focus the student's attention upon some of the more important issues raised by the case. After a brief introduction to guidelines for case analysis, this book goes on focusing on individual cases, structured under the general topics of work motivation, the human element in decision making, stresses in managerial and professional life, and political maneuvering in organizations. The next two parts are devoted to cases of small-groups and organizational behavior. Emphasis in small groups is places upon cases that have the most relevance for knowledge workers, including managers, professionals, technical and sales personnel, while in organization behavior focuses on bringing about changes in organizations, yet many of these changes are initiated at the individual and small-group level. This book is of value to college and university undergraduate and masters level courses, and in programs of management development. Bruce, the Behavior Mod Landlord. Why Do I Need a License to Get Ahead? Can Backyard Gossip Condemn Me? Creativity Requires the Right Atmosphere. Baton Rouge is a Long Way From Home. Every Author Deserves a Publisher. Is there No Justice in the Retailing Business? Making Eight is a Hassle. Give Me Equality, Not Favoritism. You Need Connections to be Obnoxious. The Puzzle Block Work Teams. The Group Decides in Brazil. The Peripatetic C.E.O. A Different Style of Leadership. A Fund Drive Needs the Right Leader. Our Leader is Too Charismatic. Why Do I Need Objectives? Who Should Eat The Cost On This One? A Cybernetics System Feedback Blooper. Last Hired, First Fired, No More. A School System In Conflict. The Isolation Blues (A Simple Case of Cabin Fever, Paranoia, and Sexual Frustration). The Drab Decor at Steel City Nursing Home. Biting Dogs Used To Be Our Worst Enemy. The Dean Practices Participative Management. The Decimation of Denver Printing.